As I planned to develop an online shop dealing with physical products, I had a chance of coming across Store Coach. 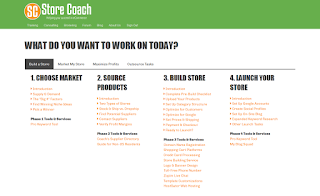 Store Coach is a training program focusing on the web. It was started by the three famous brothers in e-commerce-The Hermansen brothers. The program popularity on the web made me curious, and I decided to learn more about what they are and what makes Store Coach exceptional. They claimed to teach the critical 7-phase procedure followed while launching an e-commerce store or business necessary in ensuring steady traffic and consistent income just by sitting at home. So was my conclusion positive? Let’s dig in more. I eventually ended up working with them so am in a very strategic position of providing you with a deep review on Store Coach. What exactly is Store coach? Store Coach is an e-commerce training program based on the web. They clearly outline the steps followed when launching a competitive e-commerce store right from the first step. They cover everything for you from finding the appropriate niche and performing the necessary market analysis, promotions and ensuring maximum productivity crucial for your site. A big part of the training is done free and accessible to anyone. They also provide a charged upgrade to extra advantages in pro membership. The study at Store Coach is mainly text based combined with tutorial videos. Learning process is done in a step-by-step formula. The method comes with to-do-lists and added resources as you learn. Pro membership comes with advanced learning tutorials and tips. It also provides software to make practical tasks easier. Direct access to coaches is also provided in the pro membership. Store Coach training is focused on impacting you on how to sell through a drop ship model but is also applicable to other methods of sourcing products. Whether you plan to sell your home made goods or want to buy stock products in bulk, the process followed to your success is equally the same. SO WHAT IS A DROP SHIP? A drop ship results from drop shipping. Drop shipping is the process by which suppliers deliver your products to your customers on your behalf. This method is the most recommended at the start of your site. The process starts by you selling the product to a customer at your retail price. You then issue an order to a drop ship supplier. Here you pay at wholesale price. The vendor then sends the required product to the customer. Your physical presence is not mandatory. Your profit results from the difference between what you pay the supplier and what the customer pays. It reduces the headaches that come with traditional commerce methods. You no longer need to purchase products, stock goods and deliver them yourself to customers. Drop shipping also allows you to operate from any place in the world provided you are well connected to the internet. Incredible! Drop shipping is how many have had their success. MY REVIEW ON STORE COACH. Now that I have explained to you all there is to know about Store coach, allow me to go deeper into some other good stuff. Do you need to pay to be successful with Store Coach training? It would be possible to be successful by just following the free training and advice. On the other hand, it will be a little hard. To be fair, it is only good to make some content readily available to the Pro Members. This is done to account for their money as they move through the phase-by-phase learning process. By not paying, you will be restricting yourself from useful resources and expert advice which is essential on your way to success. What are the effects of failing to register? The initial time you meet difficulties in the learning process will be in marketing research. This will involve selecting a niche process which is essential in identifying keywords that help in ensuring your store ranks high in search engines. Pro members enjoy the Pro Keyword tool that helps in this process. Although Store coach will provide a manual process on the same, the software does this in a few seconds. As a paid member, what you need to do is just enter some sensible and related words and pressing a button. Easy enough! This tool is one of the advantages you will be missing by choosing not to pay. Being familiar with SEO or accessing a keyword tool from another source might help, but for a beginner, I would highly recommend the Pro keyword tool. The success of your business will be substantially determined by the market you enter. This is the most critical step, so you need to be careful and do it right. Honestly, the rest is easy. Direct help from coaches, available to the pro members is crucial in ensuring that your keywords are analyzed and recommended by a trainer before applying them. A community forum available full-time to answer all the arising questions is by far valuable but of course, you need to be a pro member to access it. WHAT DID I LIKE ABOUT STORE COACH? First of all, it worked very well for me! I loved how the entire learning process and advice from Store Coach worked incredibly for me. I ended up developing three successful e-commerce stores by just following the step-by-step knowledge I was equipped. I am therefore sure of the effectiveness of the lessons. The community forum is priceless for the pro members. Questions are going to arise as you learn. You will also be faced with challenges, so being able to access help directly from experts, is an incredible resource. Restricting the community forum to pro members, filters the noise you get with free forums. You are also sure to get quality and non-conflicting feedback. The store coach feedback is overseen by expert coaches so you can be sure it is approved. The tools and software are pretty good for you. Credit cards are also easily processed through special arrangements with a certified account service provider. The pro keyword tool also offers exceptional results that helped my stores rank highly in the search engines. WHAT I DIDNT LIKE ABOUT STORE COACH. Pro keyword tool only functions for the USA. This limitation might affect you a little if you don’t live in the USA. The device checks keywords using the US version of Google. However, if you live outside the USA, you can use the store coach system and inquire with the experts. Again, you could use the tool and develop a store focusing on customers from the USA. In case you want to develop a store targeting customers from another country, the tool will not work for you. So, will Store Coach function outside the USA? The answer is yes. It is ok to develop a store targeting the USA or your home country. Based on my experience, I would advise on focusing on customers from your country. Apart from the Pro keyword tool, everything else works well in developing a store outside the USA. Would I recommend Store Coach for you? I would surely recommend Store coach for you. The training is comprehensive and easy since it mostly involves text and a little reference to videos. The course offered focuses on SEO from the beginning to the end thus ensuring massive traffic to your store and therefore many clients. I am confident that the training works, so if you are ready to learn and most importantly implement what you learn, store coach is the ultimate resource for your success in e-commerce. Store Coach is made for you. Ok, I am interested in Store Coach but how much benefit will I get by becoming a Pro Member ? The biggest benefit benefit is the advance knowledge and tools that you need to start a successful store. You might don't know but there are many critical things associate with running a store for eg did you know color can affect buying decision? there are many incredible things you going to learn inside.